Get precise measurements from 3D models of transmission and distribution circuits, substations and buildings. Accurately scaled orthomosaic diagrams allow complex continuous surveying at a fraction of the cost of traditional surveying. Get highly accurate 2D and 3D “As-Is” CAD drawings to compare to design plans or to use as the basis of future modification or expansion projects. A cost efficient and safer alternative for inspecting elevated assets. Our Unmanned Aerial Vehicle (UAV) inspections and surveys offer our clients the ability to see hard to reach assets up close with the use of a 30X optical zoom camera. Capture high resolution images and immediately identify failing equipment using Infrared thermal imaging, while allowing the UAV to remain at a safe distance from the equipment. 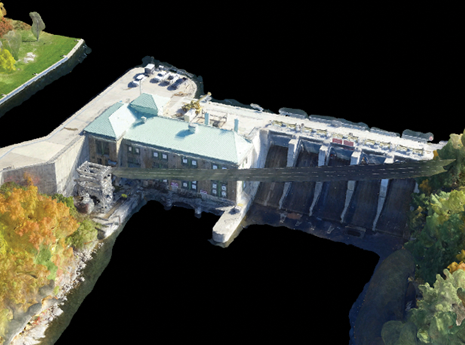 We’re experts in aerial 2D & 3D Orthomosaic Imaging, GIS Services, Geo Referenced and DEM Models. We use our mapping data such as point clouds to create contour drawings and volumetrics, produce accurately scaled AutoCAD renderings of landscapes for project planning and existing site assets or to generate 3D models of transmission and distribution circuits, substations, and buildings. AIRVU | UAV Solutions is fully Transport Canada compliant, and employs licensed fixed wing and helicopter pilots to fly our military grade UAV systems. We are a professional aviation company, flying professional UAV systems. AIRVU is pre-approved by Transport Canada to fly in Canada and can deploy rapidly for emergency situations such as storm response.